BirdKey Stono is an estuarine sandbar comprising approximately 20 acres at the mouth of the Stono River in Charleston County (where the Stono meets the Folly River). It is one of only three Heritage Preserve costal islands that have protected seabirdnesting.The preserve provides nesting,roosting and foraging habitat for a variety of sea and shore birds. Beginning inthe mid-1980s, thousands of eastern brown pelicans, several species of terns, blackskimmers, laughing gulls, two species of herons and other incidental species successfullynested on Bird Key Stono every year. From the late 1980s to 1994, the islandsupported the largest number of nesting eastern brown pelicans in the range of the species.Unfortunately, Pelicans are declining in South Carolina. 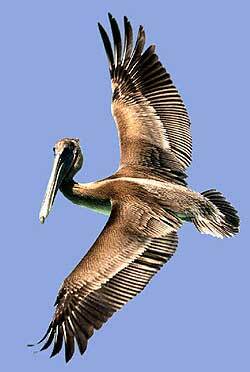 There were 7,739 nesting pairs of brown pelicansin 1989 compared with only 3,001 nesting pairs in 2002. And royal terns and sandwich ternsare declining in South Carolina at the same rate as brown pelicans. The preserve is a sandspit island formed by deposits fromassociated river systems. It shifts in position and structure due to erosion anddeposition of sand. Bird Key Stono supports colonies of nesting water birds becauseof its isolated nature and lack of mammalian predators such as raccoons and dogs. If you want to see Bird Key, you will have to go byboat  but please, do not go ashore when it is closed for nesting season. If you do,you are endangering the birds. To find out more, please follow the link below. 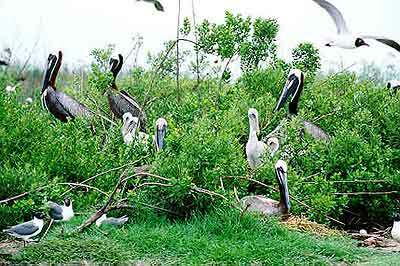 Because of bird nesting, Bird Key Stono is closed to the public April 1 – October 15 each year. Columbia, SC 29202, 734-3893To visit their web site click here.